In Grobak Padi, three traditional, pedal-driven Indonesian food carts and their cooks are not only the providers of, on this occasion, free nourishment but also, with monitors hanging from their frames, they are stations for the real time relay of performances between Jogjakarta and Sydney. A fourth, boat-shaped Grobak Padi arrives on a riverbank stage, accompanied by a synthesis of a pulsing hum and sweet high voices, smoke billowing from its small charcoal stove. 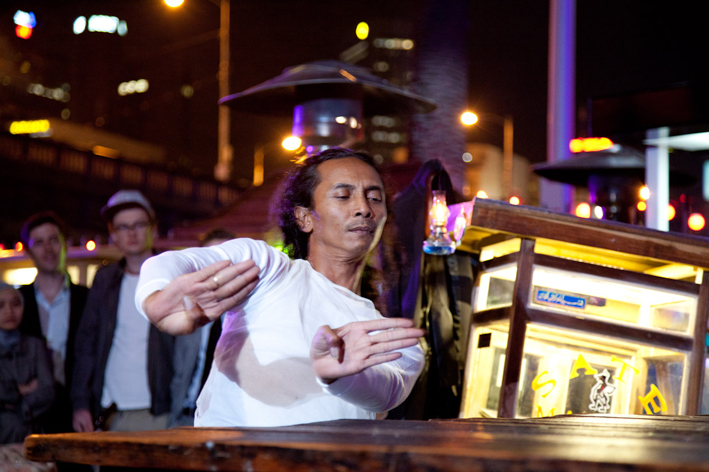 A man in suit (Tony Yap), a potential customer, approaches the cart, leaves his coat and glasses on its roof and wanders away into a private dance. ← If a system fails in a forest, is anybody listening?